The Spanish tax network follows the same standard principles as the main jurisdictions of continental Europe. Marginal tax rates on income are high, but capital gains taxation is more moderate. There is also a wealth tax for passive savings beyond a certain figure. Finally, in some regions there is an aggressive inheritance and gift tax policy. Investors from all over the world invest in Spain, and cross-border taxation is designed following standard European terms. Spain has signed 94 double tax relief treaties that follow the Organisation for Economic Co-operation and Development (OECD) model, and older treaties are being renewed. A new tax treaty with the US is still pending full ratification, as at the time of writing. There are also three inheritance tax treaties in force in Spain. Spain is not an attractive jurisdiction for wealth from a tax perspective. Having said that, there are significant differences in taxation in the different regions of the country. Therefore, the city of residence within Spain will also be an important factor in determining the total tax burden. There are still a lot of safe tax planning structures that can mitigate or protect wealth from this formally aggressive environment. There are important tax-saving advantages for business-oriented wealth, and there are some basic tax planning ideas that can reduce the tax burden for passive wealth. Several tax compliance and reporting obligations have been introduced lately, in line with EU and OECD trends. For individuals, tax residents must annually inform the authorities about all foreign assets exceeding €50,000. Trusts and other similar fiduciary agreements are not accepted inter vivos in Spain. Spanish law applies forced heirship restrictions only to Spanish nationals. However, with the new EU ruling for the harmonisation of inheritance law within Europe, the country of residence prevails if there is no will that sets nationality as a preference. Overall it can be said that the Spanish tax environment for wealth is formally aggressive and complex, following conventional standards, but there is scope for legitimate planning. In the past years, and owing to the government effort to comply with EU deficit limitations, the administration has frequently changed some of the relevant tax laws to improve collection. Nevertheless, the general tax framework has not changed. A new, important tax reform was introduced on 1 January 2015. The reform reduced the nominal tax rates for individuals (both the standard rate and the capital gains and savings income tax rate), introduced several tax advantages for lower-end taxpayers, and included a variety of benefit limitations and anti-avoidance measures. non-resident standard tax rates have been reduced for EU residents from 24 to 19 per cent. Some further changes are commented upon below. Important changes that were intended to be made to inheritance and gift tax and wealth tax have been postponed but will likely come sooner rather than later. Further, a recently formed government may introduce relevant tax measures in the following year, specifically addressed to large corporations and wealthy individuals to increase tax collection. Spain's official tax year runs from 1 January to 31 December. An individual will be tax-resident in the country for full year periods. Income tax returns must be filed by 30 June in the year following the tax year. Under income tax law, individuals are tax-resident in Spain if they have lived in Spain for more than 183 days in any calendar year; and most of their income or wealth, or both, is generated from Spanish sources (this is presumed to be the case if their spouses or descendants are habitually resident in Spain). Spanish tax residents are liable to Spanish taxation on a worldwide basis. There is no concept of domicile in Spanish tax law, and Spanish nationality has no tax relevance. Personal income tax forms the backbone of Spain's tax system, and it mainly falls on salary income. A standard withholding tax procedure collects taxes from payroll and other sources of income. After several years with marginal rates beyond 50 per cent, marginal rates for 2016 and onwards have now been set at 45 per cent. However, the different regions are able to reduce or increase the rate via tax credits. Capital gains and savings income are taxed at a marginal rate of 23 per cent since 2016. Capital gains can be compensated against losses, and the latter can be carried forward for four years. In the case of real estate, the gain in the sale of one's residence is tax-exempt if the proceeds are reinvested in another property to be used as the primary residence. Individuals over 65 years old selling their residence will not pay capital gains tax so do not need to reinvest proceeds. A special tax on gains from lotteries applies at a rate of 20 per cent. There is no capital gain tax burden on inheritance. Beneficiaries of an estate will receive the assets up to market value, and will only pay inheritance tax. High-ranking executives and other professionals can reduce a small part of their tax burden with certain limited payments in kind, exemptions on work performed abroad and, in some circumstances, up to 30 per cent of the tax on deferred bonuses that has been vested for more than two years. However, these benefits are all capped and will never imply a significant tax saving. For passive wealth, the basic strategy is the deferral of taxes. Investment in UCITS has a favourable tax treatment since the sale and reinvestment of proceeds from one fund to another will not trigger tax and the capital gain is deferred until the funds are withdrawn or invested in other assets. This tax deferral requires a Spanish trading entity to deal with this reinvestment process and to report to the tax authorities. Wealthy families can also hold their own investment companies (SICAVs) following the UCITS model, and can reinvest proceeds within the entity with only a 1 per cent tax on profits or gains realised. Other financial products, such as savings insurance policies or life annuities, can be structured in tax-efficient ways. Spanish tax residents must declare and pay wealth tax, which is levied on the value of worldwide net wealth exceeding €300,000 for a personal home and possessions and €750,000 on other assets. Madrid is the only region not subject to this tax. The marginal rate, depending on the region, will be between 2.5 and 2.7 per cent above €10.7 million. This can be a significant yearly burden for wealthy taxpayers. 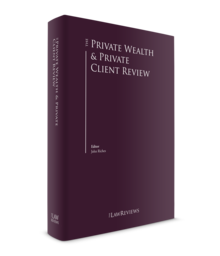 However, private wealth that is included in a family company is not subject to wealth tax; thus, most family businesses are structured in a way so that investments fall under the same umbrella as the active business. For passive wealth, there is a general limitation of combined tax (income tax plus wealth tax) that cannot exceed 60 per cent of total income (excluding capital gains) for the year. The best strategy is, therefore, not to live on income but on the returns of investment capital. Following this strategy, wealth tax can be reduced to a minimum rate of 20 per cent of the standard tax bill. Recent positive rulings and judgments provided more legal certainty for life insurance policies, with no redemption right as an investment vehicle to legally avoid wealth tax. As a result of this and other tax-saving strategies, wealth tax does not collect much money, and only professionals and top executives are being hit by this levy, which was created in 1977 in a totally different economic environment. It has an obsolete framework, tax rates are very high compared with market interest rates in the past years and it is highly criticised by most technical commentators. Non-tax residents are only taxed on Spanish-sourced income. The standard rate is 24 per cent (for EU residents the rate is 19 per cent), and the rate for interests, dividends and capital gains, provided that no treaty is applicable, is 21 per cent (for EU residents the rate is 19 per cent). In most circumstances, taxation of non-resident individuals in Spain is ruled by one of the tax treaties that Spain has signed, which mostly follow the OECD model. An interesting tax regime is available for non-resident individuals coming to Spain. According to this regime, such individuals are taxed as if they were non-resident on their Spanish-sourced income and foreign labour income as well as non-resident rates of tax. The relevant individuals should have either a labour agreement or appointments as directors in place that are applicable in Spain. Individuals benefiting from this regime are still deemed to be tax-resident in Spain. The regime applies for a maximum of €600,000 per year and for five years plus the remainder of the year in which the individual arrived in Spain. This special regime is no longer available for incoming sportspeople and performers. A new exit tax that has been introduced in Spain follows principles similar to those found in the French and German exit tax regimes, and is levied on assets exceeding €4 million. It has been adapted to the requirements set by the European Court of Justice not to create conflict with the principle of freedom of movement of persons within the EU. There are pre-immigration tax planning ideas that could reduce or even eliminate the yearly tax burden of incoming individuals living on passive income. Non-residents are also subject to Spanish wealth tax on their personal assets that are located in Spain or that can be exercised in Spain. For instance, if they own a property in a region that levies wealth tax, they will pay such tax provided that the value of the property exceeds the minimum exemption threshold of €750,000. There is no wealth tax for corporations, so an easy way to circumvent this issue in the case of large property investments is to carry out such transaction through a foreign company. In Spain, gift and inheritance tax is on beneficiaries and not on the gift or estate level. Spanish tax residents (based on the same principles as above) will be liable on all gifts or benefits received from inheritance, regardless of the location of the assets or the residence of the deceased. Non-tax-resident individuals will only be liable to Spanish inheritance and gift taxation for Spanish-situated assets. There are no general tax-free allowances. Special and limited allowances are applied to the mortis causa transfer of the home or the mortis causa transfer of wealth to minors. There are very important differences regarding the effective taxation of gifts and inheritance for first-degree transfers of wealth, meaning spouse, parents and grandparents to siblings and grandchildren, and vice versa. In regions such as Catalonia, La Rioja, Madrid, Navarra or the Basque region, there is a very significant tax reduction on first-degree transfers of wealth, both inter vivos or mortis causa. This tax advantage is also applicable to beneficiaries resident within the European Union. The tax saving of this benefit can be substantial, since the marginal tax rate goes up to 34 per cent for transfers above €680,000. In certain circumstances, transfers of family business within the family in any region can benefit from a 95 per cent tax reduction, because the family is not obliged to sell or mortgage the business to be able to pay a tax bill. The beneficiary must continue the business (or retain the shares) for at least 10 more years (five years in some regions). For transfers to nephews, nieces or cousins, the rate can jump to 50 per cent, and for third parties it can go to up to 68 per cent. As such, in the case of inheritance falling outside the immediate family, it is paramount to study other alternatives that could reduce the tax bill. Each beneficiary is liable for inheritance or gift tax on the value of the share of the estate received according to his or her personal circumstances. For tax purposes, there is no significant difference between gifting assets during one's lifetime or by will; both are taxed on the same principles. However, it should be remembered that a gift in kind (for instance, a property) will also trigger capital gains taxation on the donor, while for mortis causa there is no capital gain taxation, although the assets are received by beneficiaries with a step-up to market value. There is a municipal capital gains tax on the transfer of real property located in Spain, which is also payable on death and on lifetime gifts. This municipal capital gains tax is based on the cadastral value of the land and the length of time that the property was held by the transferor and, according to recent judgments, should only be levied in the case of realised gains (and not in case of a loss) from the sale of the property. This tax is deducted from the tax basis of inheritance and gift tax. Finally, it should be noted that trusts are an alien concept to the Spanish legal system. Spain has not even signed the Hague Convention for the Recognition of Trust Consequences. The tax authorities have adopted a very negative stance on trusts, with the exception of plain trust wills. The most common approach taken by the Spanish tax authority is to ignore the trust and deem the assets to be still in the hands of the grantor or settlor, even in the case of irrevocable trusts. Plain trust wills that are wound up together with the distribution of the estate are deemed normal wills. In any other situation, the Spanish tax consequences are unpredictable; therefore, it is of paramount importance to review the case if there are Spanish assets involved or if Spanish tax residents are beneficiaries to a foreign trust. The complex and uncoordinated inheritance tax framework that exists throughout Spain is being discussed at the time of writing. It is likely that a minimum coordinated tax rate will be set for all regions, and that each region will set its own rules regarding this, although never allowing the total tax burden to fall below the minimum coordinated rate. In terms of cross-border structuring, two situations merit some thought. First, pre-immigration planning is necessary for wealthy non-Spanish tax residents coming to Spain. Considering the personal situation of such person and the nature of his or her wealth, several pre-immigration steps could be taken to create a safe tax structure under which he or she would be able to live in Spain with a limited tax burden. As previously mentioned, the key is living on returns of capital instead of income. Second, investors in Spain, and especially in real estate property, can be misled by offers of cheap offshore structures that are no longer viable. If the property is worth enough, there are legitimate ways to mitigate future capital gains tax on the sale of the property and legally avoid Spanish inheritance tax risk, such as holding the property through a double corporate structure with the main holding company being a non-Spanish resident company. Most of the highest net worth individuals or families are the first or the second generation of a family business, and most high net worth individuals have their own close personal advisers. These are very often tax experts, and at the higher end they often have a family office to deal with investment issues outside of the family company. Private banks and special units of retail banks also often manage most of the investments of high net worth individuals and families. As previously mentioned, an important part of the financial investments of wealthy families is wrapped up in SICAVs, which are collective investment vehicles in listed securities that only pay 1 per cent tax on net income. The use of SICAVs by such wealthy families will probably be limited in the near future. Independent financial advisers are also a reality in the Spanish market, but are not as widespread as they are in other countries because of the regulatory requirements and compliance burdens involved in obtaining and retaining a licence. It must be highlighted also that the tax authorities are intensifying tax inspections of high net wealth individuals and families (including top sportspeople and entertainers) and are challenging the aggressive tax planning strategies that some of them have in place. In Spain, as in most of Europe, wealth that is invested in a family business will generally be protected; it will not be subject to wealth tax, and profits will not be taxed unless they are distributed. A simple holding company would avoid double taxation of profits within the group, and profits can be reinvested without further taxation until they are paid out to individual investors. A visa residence permit is available for foreign investors and entrepreneurs under several investments requirements. In Spain, forced heirship regulations apply only to Spanish nationals. However, with the new EU ruling for the harmonisation of inheritance law within Europe, the country of residence prevails if there is no will that sets nationality as a preference. Hence it can be paramount for a foreign permanent resident to formalise such will since otherwise he or she could be caught by forced heirship provisions of Spanish inheritance law. Under the forced heirship regime, two-thirds of a person's total assets must be distributed between the forced heirs (direct descendants, direct ascendants (if there are no descendants), spouse).3 Out of this two-thirds with restrictions, one-third of the estate must be distributed equally among the forced heirs, and the remaining third can be used to improve the conditions of any of them. The spouse has the right to receive a life interest (usufruct) in the assets comprising the compulsory one-third share received by the descendants under the forced heirship regime. A third of a person's estate can be freely distributed by will. There are some regions where the forced heirship regime does not apply or is modified, such as Navarra (where there is no forced heirship regime), the Basque region and Catalonia (where there are specific rules than can partly override the forced heirship regime). If the deceased is a Spanish national from outside the above-mentioned regions, the forced heirship regime cannot be avoided. The general rule is that the forced heirship regime applies to all distributed assets, regardless of the beneficiary's residence. The forced heirs can waive the right to receive their share, or propose a different distribution of the assets subject to the other forced heirs' rights under the regime. For Spanish nationals, matrimonial law will be the law of the first residence of the couple. Non-Spanish nationals will be ruled by the law of nationality and, if this is not definitive, the law of the residence of the couple. The economic terms of nuptial and prenuptial agreements for the administration of the family are generally accepted by the Spanish courts if they follow the principles of the law of the jurisdiction in which the couple lives. As previously mentioned, trusts are not recognised in Spain, and their effects cannot be imported into Spain. From a tax perspective, if a trust is operating with Spanish assets, the tax authorities will probably ignore the trust and allocate the assets to the grantor or settlor even in the case of irrevocable trusts. However, there are no clear and uniform criteria from the tax authorities in this regard; therefore, trusts should not be used for tax structuring purposes in Spain. Regarding family law, claims against trust assets by the spouse or civil partner of a settlor or beneficiary on the dissolution of a marriage or partnership must be filed in another jurisdiction, as Spain does not recognise trusts. Private foundations are also not possible in Spain. All foundations should have an object of public benefit and should be supervised by the relevant public authority. Foundations are the typical legal form of charities in Spain. Foreign private foundations are also ignored by the tax authorities except when they are the substitute for a will, in which case they could be treated as such. Partnerships are recognised and treated as tax-transparent vehicles. They are frequently used for handling shared property and for international business ventures. Family partnerships are also common in family businesses with multi-jurisdictional partners. However, the most common vehicle for all business purposes in Spain, including family businesses, is the limited liability company. The limited liability company follows the general principles of companies with shares in which voting rights are linked to shareholding percentage. They can be used directly as business entities or as holding entities owning the shares of a group of companies. A holding company acting as head of a group of subsidiaries is also common practice. This structure permits an easier formation of voting majorities for the whole group, and at the same time helps reinvestment of profits all over the group through the holding company and thus defer taxation of such profits at the level of the shareholders. If the business group also holds interests in foreign companies, it can also be established as a foreign securities holding company, which is a special tax status for entities with qualified foreign shareholdings that can provide tax advantages to its shareholders on foreign dividends or foreign portfolio gains. In Spain, there are strict anti-money laundering provisions following EU directives and international guidelines. All practitioners, bankers, attorneys, notaries and authorised wealth managers are bound by strict compliance regulations, and are thus obliged to keep records of clients' identities and activities, including the source of their wealth. There is also an obligation to report to the Bank of Spain any operation that could be suspicious of involving money laundering, with the exception of matters protected by lawyer–client privilege when defending a client before the courts. For several reasons that are unrelated to tax, Spain has been an attractive country in which to live or to invest in real estate property. Taxes in Spain have been high, following European standards, for the last 20 years, but there has always been scope for legitimate tax planning that has mitigated the Spanish tax burden for well-advised incoming residents or investors. The extraordinary tax situation that existed in Spain in the past few years – with the high national tax rates that applied to most taxable income during 2012, 2013 and 2014 – has changed since 2015, when there was a reduction in tax rates (an average reduction of 7 per cent on marginal rates) that has had an impact on most taxpayers. However, the benefits that have been gained from the reduction in the national tax rates have to some extent been offset by the introduction of several important reductions in the tax benefits that were available before and with a more aggressive wording of the anti-avoidance provisions, both of which have created a more complex landscape for tax planning in Spain. Tax collection efforts focus more on both domestic and multinational large corporations that have used and abused the tax law with very aggressive tax-leveraged structures and extreme transfer pricing policies. Corporation tax has recently been subject to a variety of measures to reduce the list of tax-deductible expenses, and there have also been significant reductions in most of the tax credits that have been available to date. Under a tax amnesty that took place in 2012, individuals holding non-declared assets could disclose these assets subject to a very low tax payment of 10 per cent calculated on the yield or gain obtained on such assets during the past four years. However, non-compliant wealthy individuals living in Spain may have a difficult time in future years. Exchange of information and cooperation agreements for international tax collection are now a reality and it is futile to hide wealth abroad or to ignore unpleasant tax laws. Spain has signed a Foreign Account Tax Compliance Act agreement with the US for the automatic exchange of information on tax-resident individuals or US citizens and foreign financial investments. Tax residents in Spain must disclose all foreign assets to the tax authorities every year; failing to do so could give rise to large penalties beyond the value of the hidden assets, and the forced incorporation of undeclared assets may lead to relevant tax assessments that could result in a tax crime, punishable by up to six years in prison. Overall, Spain follows the trend of the conventional jurisdictions of Europe, where taxes on the generation of wealth are significant but where living on passive income can be subject to efficient tax planning. 1 Pablo Alarcón is the founding partner of Alarcón Espinosa Abogados. 2 The gateway for tax information, compliance and other tax services is www.agenciatributaria.es. 3 Each category precludes those subsequent from receiving a share of the deceased's estate.